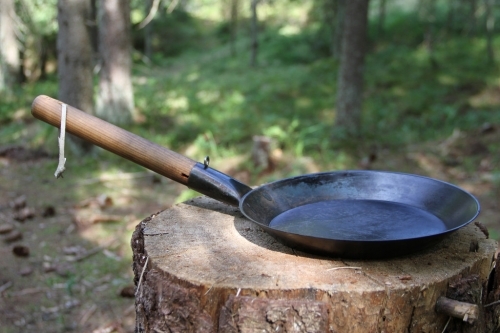 When the Finns walked in the deep forests or over Lapland, they always had a black iron frying pan with them. 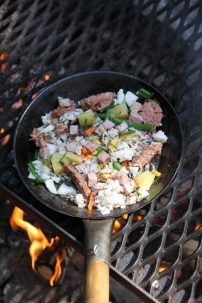 The Woodsmen made all their meals on the pan and also ate from it! These Wilderness Frying pans measure 23cm in diameter and have a Birch Wood handle which can be easily replaced if/when required. The handle is removable for storage/transport. The pan itself is made from black 7.5mm iron. 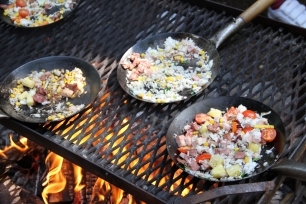 These pans are excellent for camp fire cooking and offer a great alternative to heavy cast iron, they are lightweight and easy to clean. Suitable for use over an open fire, on a stove top or BBQ or on the gas hob at home. Traditional Finnish quality and design. The Wilderness Frying pan also available in 30cm diameter size.